Assessing the limits of pluralism, this book examines different types of political inclusion and exclusion and their distinctive dimensions and dynamics. Why are particular social groups excluded from equal participation in political processes? How do these groups become more fully included as equal participants? Often, the critical issue is not whether a group is included but how it is included. Collectively, these essays elucidate a wide range of inclusion or exclusion: voting participation, representation in legislative assemblies, representation of group interests in processes of policy formation and implementation, and participation in discursive processes of policy framing. Covering broad territory-from African Americans to Asian Americans, the transgendered to the disabled, and Latinos to Native Americans-this volume examines in depth the give and take between how policies shape political configuration and how politics shape policy. 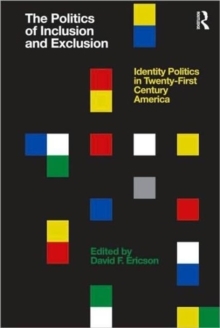 At a more fundamental level, Ericson and his contributors raise some traditional and some not-so-traditional issues about the nature of democratic politics in settings with a multitude of group identities.